Plans are underway to spend $60 million to add 72 beds more to the 12th floor and a portion of the 10th floor to the Ohio State University’s (OSU) new 21-story cancer and critical care tower. Completed in December 2014, the OSU’s new cancer and critical care tower, officialy named the “Arthur G. James Cancer Hospital and Richard J. Solove Research Institute,” but commonly just called “The James,” is designed to accommodate 348 inpatient beds, 252 acute care beds, 24 bone marrow transplant beds, and 72 critical care beds. The clinical space provides outpatient service, expanded operating rooms, radiation oncology space with eight linear accelerators, inpatient rooms, a pharmacy, translational research areas, a public concourse, and meeting space. 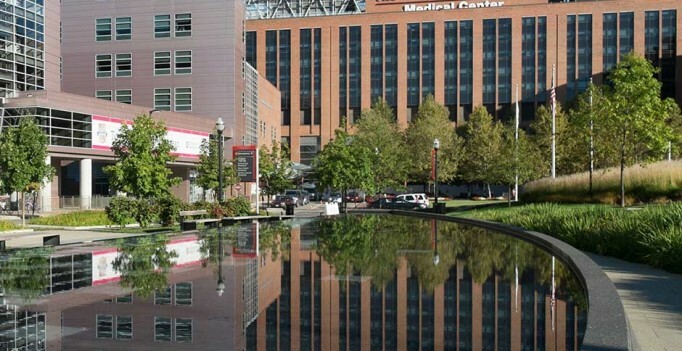 The planned expansion of The James would be bringing the tower’s total number of beds to 420 and would help the university’s Wexner Medical Center (formerly called the Ohio State University Medical Center) to keep pace with the growing demand. Admissions to the cancer hospital has grown at an annual rate of 15 percent. Before the tower opened to the public, cancer patient admissions to Wexner had been growing at 5 percent to 8 percent annually according to university sources. The Wexner Medical Center, with its numerous facilities, which include The James, is the multidisciplinary teaching and research medical center of the OSU College of Medicine which is located on the main campus in Columbus, Ohio. The planned expansion of the cancer and critical care tower is expected to be implemented from February 2017 to July 2018. According to Gail Marsh, the chief strategy officer at Wexner Medical Center, once the new beds are available, Ohio State should have at least 95 percent of its patients in private rooms. Marsh said Wexler now operates at 1,270 beds, but it will rise to 1,340 once the medical center’s new brain and spine hospital opens later within the year. The planned expansion at The James would eventually further boost the overall bed capacity at the university’s medical center to 1,415. OSU’s Wexler Medical Center is considered one of the best hospitals in the United States, and its College of Medicine is nationally recognized as among the top medical institutions in both education and research. Founded in 1870 as a public research university, the OSU operates 16 colleges and schools at its 1,764- acre main campus in Columbus and its regional campuses in Lima, Mansfield, Marion, Newark and Wooster. The university currently serves 64,868 enrolled students. It has 19 men and 20 women athletic teams, collectively called the Buckeyes, competing in the NCAA Division I and Big Ten Conference. The varsity colors are Scarlet and Gray. The university mascot is Brutus Buckeye.